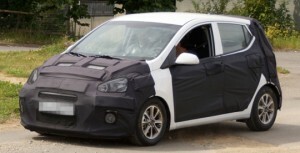 The all-new Hyundai i10 is a car that is refusing to move from the industry headlines. There have been several sightings of the vehicle being tested in India, and it’s also known that it will be available here shortly after its international launch. Rumors are flying about the new hatchback, with the latest being some speculative renderings from the good folks at ICB. These are intended to give consumers an idea of what to expect from the i10. The rendering take into account Hyundai’s “fluidic sculpture” design, which would put it in the same ranks as the new Sonata and the Elantra compact car. The car might even make its debut in India with the i15 nameplate. There are also some who believe that “Brilliant” might very well be the name given to the vehicle. Read more latest Hyundai news here! Whatever name the vehicle goes by, one thing you can be sure of is that it will have a diesel engine variant powered by Hyundai’s 1.1L CRDI oil burner. The 1,2L gasoline “Kappa” engine, which appears in the curent models of Hyundai i10 and i20, will continue to be available. You can also expect the new vehicle to offer more in space, quality, and equipment, so that it would be more in line with its biggest rivals.